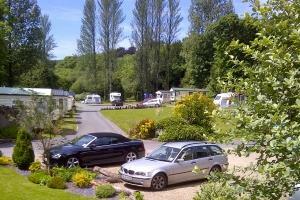 Small family Park with luxury holiday caravans for hire along with Touring & Camping too. Tremendous location for walking or cycling to the local beaches & pub - level mainly traffic free route all the way to Saundersfoot. Something about your stay here will make it special for you, exploring the rock pools, finding the dungeon in Pembroke Castle or it could be just enjoying a leisurely lunch watching the Buzzards soaring above the valley. Freezer available for ice packs Children welcome from any age. If you need to utilise our facilities thay are accesible for someone with limited mobility, due to constarints of the building coupled with the size of the Park they are not adapted for use by someone who relies on a wheelchair. Pitches are linked by gravel paths to tarmac rd, opposite the Park is a multi user path linking to Saundersfoot via Wiseman's Bridge level and surfaced route. If you require more detailed information in order to assess if we are suited to your needs please contact us.